Audionamix presents version 2 of its ADX VVC plug-in allowing to change the level of a vocal or other melodic content within a stereo mix. 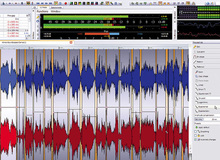 Melodyne Essential is the least expensive version of Celemony's acclaimed editing software, and though it doesn't have the same feature set of its big brother Melodyne Editor, it's nevertheless quite powerful if you need to correct pitch and adjust timing. Native Instruments took advantage of the Sónar festival in Barcelona to officially introduce its new Stem format with a dedicated website. Tascam has released a new high resolution DSD and WAV editor software for Windows that you can download for free.